Ethnicity has long been a central concern of Mesoamerican ethnography, but for methodological reasons has received less attention in the archaeological, historical, and art historical literature. 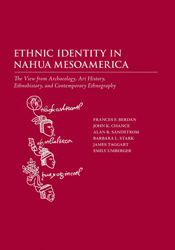 Using the disciplines of archaeology, art history, ethnohistory, and ethnography, Ethnic Identity in Nahua Mesoamerica provides a unique interdisciplinary treatment of Nahua identity in central Mexico — beginning with pre-Columbian times and proceeding through the Aztec empire, the colonial era, and the ethnographic present. This book is the first to analyze ethnicity in a single place over a span that covers prehistory, colonial history, and contemporary life. The authors bring to their various case studies data, methodologies, and concepts of their respective fields to show how Nahuan concepts of ethnic identity are not based on the notion of shared descent but rather on conceptions of shared place of origin and common history. Frances F. Berdan is professor of anthropology and co-director of the Laboratory for Ancient Materials Analysis at California State University, San Bernardino. John K. Chance is professor of anthropology at Arizona State University. Alan R. Sandstrom is professor of anthropology at Indiana University–Purdue University Fort Wayne. Barbara L. Stark is professor of anthropology at Arizona State University. James Taggart is professor of history and archaeology at Franklin and Marshall College. Emily Umberger is professor of art history at Arizona State University.